This article by Karl-Heinz Bußbach, Global Business Director AZO®Poly, shows that every compounding plant must satisfy specific requirements. This is where custom designs are called for and these require plant manufacturers to have extensive, in-depth knowledge and experience of processes and raw materials and an intelligent portfolio of products. As a result of increasingly complex requirements, the various stages involved in compounding are gaining in importance throughout the value chain for manufacture of plastic parts. Mixing different base materials ensures that end products have a wide variety of functions and properties. 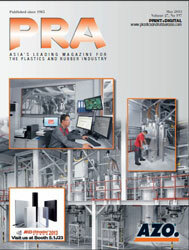 The challenges involved in materials handling are equally diverse: unstable materials, combustible or abrasive components, fluctuating MFI figures within a process, a large number of raw materials, a wide variety of formulations and stringent requirements for quality and product liability, to name but a few. This is why individual concepts for plants are needed when it comes to compounding processes. These concepts should ensure a high degree of flexibility and reliability for low to high rates of output. The following components are relevant to processes and safety when handling materials in a closed nitrogen cycle: filters, gas analysis, circulation fans, microfilters, pressure sensor system, nitrogen buffer container, blower/compressor, dryer, valves (shut off and check valves). The raw polymer powder is conveyed from batch operation by a receiving hopper with recording of weights in silos using the central-tube mixing principle. During and after filling, the polymer powder is homogenised through circulation and subsequent discharge to the scales. This makes it possible to blend materials from different silos. There is also an active blending silo with screw feeder ahead of the loss-in-weight feeder for dosing the powder gravimetrically. The finished goods are homogenised by moving them into several PP granulate silos and then discharging them, using a multi-tube mixing principle, in order to ensure maximum homogeneity of the finished compound. 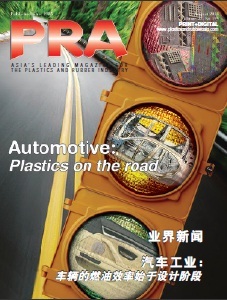 The second illustration concerns compounding of high-fill polymers. A variety of particular factors need to be taken into account here. Due to the high fill level of up to 85%, this process is a very critical one. Many of the raw materials pose exacting requirements on materials handling because of their complex and unstable properties. Products are fed over combined discharge bases for big bags and sacks. Planning must take into account requirements for dust-tight docking, integrated filters with fan for a clean working environment, a safety support with massager device for improved discharge, a safety lock for pallets, including work platform for ergonomic operation, and sufficient buffer volume. 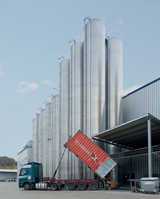 Storage and feeding are also possible from silos and octabins. To improve product discharge, vibration bottoms are used that can be adapted to accommodate the specific product. Aeration bottoms can be used in addition to fluidise the product. The raw materials are conveyed to the compounder using a pneumatic vacuum conveying system, which uses reliable, time-tested components. In the case of granular constituents, a premix can be made with the AZO®MIXOMAT mixer system. The AZO®MIXOMAT combines several systems in one machine: it is a receiver, scales and mixer in one and can also be used in ATEX zone 20 and with powdered products. 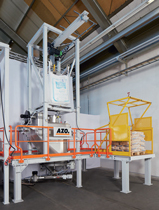 AZODOS® dosing units coupled with AZO®CONT controls are used for continuous, gravimetric feeding of the compounder. In order to ensure maximum dosing accuracy with the AZODOS® devices, controlled and steady filling of raw materials is critical in order to rule out any variance in volumetric dosing as far as possible. A typical feature of the devices is their ease of cleaning, which is a major advantage in master batch production, as reducing the cleaning time results in an increase in overall output. The main constituents are stored in outdoor silos, big bags or Octabins and are fed into the loss-inweight feeders above the compounder using pneumatic conveying. Small and medium quantities are filled into containers, identified, marked with barcodes and stored at the ready in a high-bay warehouse until further processing. This action rules out any chance of confusion. 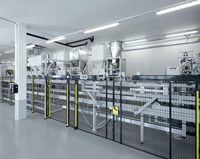 The containers with components needed for the formulation are deposited on the AZO DOSINENTER® linear weighing system using a laser-controlled AGV system. Mobile scales are conveyed along under the components and collect those required for use in the formulation. As soon as the entire batch has been assembled, it is discharged into a pre-mixer and mixed homogeneously. Similar to the major components, the premix is conveyed to the loss-in-weight feeders above the compounder. In addition to the powdered bulk materials, various liquid components are also added into the process. 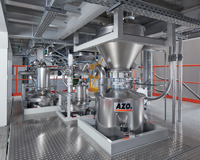 After the actual compounding process, granulation and drying take place before the finished goods are either immediately filled or transported to silos with an AZO®MULTIAIR densephase conveying system. This innovative method is especially suitable for attrition-free conveying without segregation over medium and long distances with high throughput. Unlike dilute-phase conveying, the energyefficient AZO®MULTIAIR conveys products at minimum speed and with minimum requirements for air. Conveying therefore results in an extremely low rate of wear for products and the feeder line. Nor does the process cause segregation and it is very energy-efficient. There is no wear or destruction of the particle structure. The optimum load and conveying velocity is adjusted for each product and each conveying distance on an individual basis. Energy efficiency was a decisive factor when constructing this new plant. Base materials are stored in 16 outdoor silos. From here, the 14 extruders are fed with raw materials over distances of 35 to 120 metres. To a certain extent, the raw materials have different properties and bulk density. The capacity of the individual extruder lines is up to 2,500 kg/hour. At the same time total flexibility is required: every product needs to be transported to every receiver. As every extruder line has its own vacuum pump, use of an intelligent power management system exploits the maximum potential for saving both energy and resources. In order to achieve the best possible design for the plant, conveying trials with different conveying lines and air quantities were tested out in AZO’s Technical Centre. This identified the most efficient operating points for the pumps. The solution is based on conveying with adjustable air quantities using vacuum pumps, which are operated at frequency converters. The savings in energy are huge when compared with operation using a complete pump system. To achieve the best possible outcome in respect of overall life-cycle costs, it was necessary to take a range of different aspects into account when designing the conveying system. Accurate dimensioning of the conveying system, selecting components and planning storage locations were equally as important as the controls for the plant as a whole using intelligent process IT. What is more, this resulted in critical advantages in processes. Less wear, segregation and angle hair mean less outlay for maintenance. As the materials involved in this process are to some extent highly abrasive and have reinforcing fibres, protection against wear is also important. This requirement was met by selecting specific materials. Ceramic pick up shoes, receivers with oxide ceramic lining and ceramic inlets as well as glass elbows, glassfibre- reinforced jackets and silicon carbide coatings. The examples illustrated show that every compounding plant must satisfy specific requirements. This is where custom designs are called for and these require plant manufacturers to have extensive, in-depth knowledge and experience of processes and raw materials and an intelligent portfolio of products, which need to be designed to make best use of them.